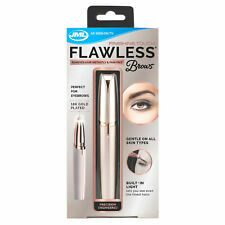 JML Finishing Touch Flawless Brows. Finishing Touch Flawless Brows is the precision-engineered eyebrow shaper and hair-remover of the Finishing Touch range, with a smaller, super-accurate micro-precision trimming head, encased in 18 karat gold plate. Reflections of Trinity is a 501 (c)3 non profit dedicated to serving those in crisis with food, clothing and basic needs. 1 x Rechargable Hair Remover. New Safe and gentle on the most sensitive skin. 1 x Foil Head. 1 x Cleaning Brush. With Move power switch to "ON" position (toward the Sensa-Light head). Use anywhere there’s unwanted hair - safe on all skin types and colors. 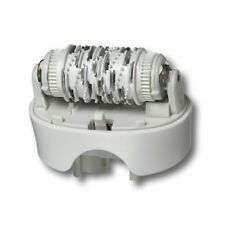 Genuine Braun 67030946 Standard Epilator Head for Various Models suitable for use with the following models Silk-épil 9, Silk-épil 7 - SkinSpa, Dual Epilator, Legs Body & Face, Legs & Body, Legs / Silk-épil Xpressive / Super Solo / BGK. MINI EPILATORE DONNA PORTATILE FLAWLESS BROWS RIMUOVI E AGGIUSTA PELI E SOPRACCIGLIA. Adatto per pelli sensibili e sottili. Si ottengo risultati perfetti anche per la rimozione dei peli sul labbro superiore. MINI DEPILATORE PORTATILE FLAWLESS. MINI EPILATORE DONNA PORTATILE FLAWLESS BROWS RIMUOVI E AGGIUSTA PELI E SOPRACCIGLIA. Modo istantaneo e indolore per ritocchi delle sopracciglia i, adatto anche ad altre parti del corpo. Clean Easy NON-LASER Personal Electrolysis Kit For The Face and Body. Retractable styled tip will not ever pierce the skin. Removes unwanted hair. Economical with professional results. Style: Epilator. 1 x Epilator. Before laser hair removal before use off certain parts of the hair, hairy first scrape, because it will hinder the. High repetition pulse rate: flash each 3.5 sec. Results clinically proved: up to 82% less hair 1 month after 6 sessions, ideal for full body hair removal, including. Do NOT use while bathing or showering. Move power switch to ""ON"" position (toward the Sensa-Light head) Power LED Flashes when ""ON""Front LEDs (near Sensa-Light head) will flash at 0.5 seconds to let you know product is ready. Emjoi's patented Glide Technology reduces irritation. To reduce the chance of ingrown hairs, Emagine features exclusive Middle Lifting fingers that raise flat or short hairs for easy epilation. The results?. Condition is New. RECEIVE AS PICTURED. IF YOU HAVE ANY ISSUE, I WILL SOLVE IT. Finishing Touch Flawless: The gold-plated, discreet hair remover you can use anywhere. The gold-plated, discreet hair remover you can use anywhere. The design of Finishing Touch Flawless is a huge benefit for ladies who want to carry a hair remover wherever they go. Rimuovi peli portatile per donna istantanei, con luce incorporata consente di vedere anche i peli non visibili ad occhio, nessun urto, nessun rossore, nessuna irritazione. è ideale per la cura del viso e del corpo, maneggevole e leggero. Ideal for eyebrow threading, upper lip and other facial hair. Facial threading has been around for centuries in the eastern countries and is a perfectly natural way to get rid of unwanted hair. It is done by manipulating threads rapidly and results in elimating hair. 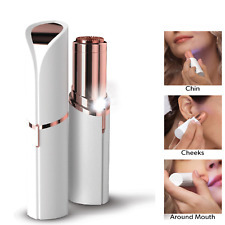 Removes Peach Fuzz so Make-up Glides-On Flawlessly. Removes Facial Hair Instantly and Painlessly from Lip, Chin, Cheeks. 1x cleaner brush. Built-in Light So You Never Miss a Hair. Box not included. EPILATION PARFAITE: repère, attrape, et enlève le poil disgracieux à la racine. Votre peau est douce au toucher! Agrandir photo. 1 x Mini brosse. 1 x Épilateur. Poids: 65g. Piles: 2xAAA/LR3 (non fournies). Quantity: 1 Removes Facial Hair Instantly and Painlessly from Lip, Cheeks; Built-in Light So You Never Miss a Hair. Grab the upper section of the unit with the one hand, the bottomd half with the other, and pull apart to reveal the battery chamber. Braun Silk-epil 3 SE -273 Kabelgebundener Epilierer, mit 3 Extras (2018 Version). Der Braun Silk-epil 3 Epilierer entfernt Haare sanft an der Wurzel, für langanhaltende Ergebnisse. Er entfernt selbst kürzeste Härchen. Super Hair Remover. 1-RechargableYes Finishing Touch Hair Remover. Do NOT use while bathing or showering. 1-Cleaning Brush. Use anywhere there’s unwanted hair - safe on all skin types and colors. Upon completing the hair removal, simply move the power switch to “OFF” to shut down the unit. Epilateur TWEEZE. Transportable partout. - Vendeur Français - Entreprise Française -. REMOVES UNWANTED HAIR FOREVER. REMOVES UNWANTED HAIR FROM EYEBROWNS, UPPER LIP, BIKINI AND BODY. GREAT DEAL NO RESERVE! Flaunt impeccable, smooth legs with the help of the Finishing Touch Flawless Legs Hair Remover. Care & Cleaning: Clean with brush. Hair Type: All Hair Types. Great for all skin types. Product Warning: Adult Use Only. Use the 'normal' speed for epilating areas with finer hair, hard-to-reach areas and areas with bones directly under the skin. You can use the 'quick' speed for epilating larger areas and thicker hair. PERFECT BROWS : L’ÉPILATEUR DE SOURCIL RÉVOLUTIONNAIRES ! Combattez la repousse et éliminez les poils indésirables avec précision. La vie n'est pas parfaite, mais vos sourcils peuvent l'être! Commandez maintenant et profitez de cette manière pratique et innovante de conserver Perfect Brows! Precisely remove facial hair by the root with the facial epilator or cleanse skin pore deep with the facial brush. For use in your shower routine with your favourite cleansing gel Waterproof & Washable Battery operated. Upon completing the hair removal, simply move the power switch to ?. to shut down the unit. -Use anywhere there's unwanted hair - safe on all skin types and color. Move power switch to "ON" position (toward the Sensa-Light head). Item Type:Epilator. Hair Remover . Features:Hair Removal. Plug:Adapter plug. Use:Bikini,Body,Face,Underarm. Remington EP7010 Women’s Total Coverage Epilator Tweezing Legs Hair Removal -NEW. Condition is New. Shipped with USPS First Class Package. 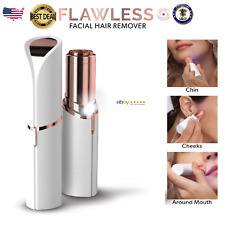 Finishing Touch FLAWLESS Facial Hair Remover, 18K Gold Plated, FREE SHIPPING!! JML FINISHING TOUCH FLAWLESS. REMOVES HAIR INSTANTLY AND PAIN FREE. 9040s, 9080cc, 9093s, 9095cc, 9240s, 9242s, 9260s, 9280cc, 9290cc, 9291cc, 9292cc, 9293s, 9295cc, 9296cc, 9297cc, 9299s. Genuine Braun Series 9 Gold Charging stand 81676503 For use with. Tête d'épilation lavable pour plus d'hygiène et un nettoyage facile. The Epilady Speed is specifically designed for fast and easy hair removal. Removes even the shortest and finest hairs, leaving skin smooth for up to 4 weeks. New Perfect Angle Guide (PAG) will ensure the best results right out of the box.